Could this be cutaneous lymphoma? 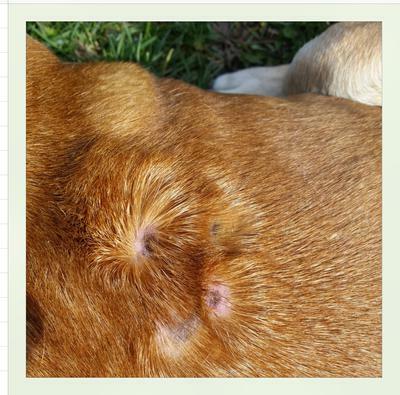 It's not mange or ringworm, There are some bacteria, but it did not respond to covenia. I'm not sure if the dermalone is working. The vet is now culturing for bacteria. I first saw one lesion, then another a few days later. 10 or 12 days after the covenia there were another couple of lesions - then some more. Now about 8 total with 4 in a cluster on the back. They are round, flat, dark in the middle and crusty on the edges. The hair comes out with the crusts. Tyler is 14.5 years old. Mix breed 60 lbs. He has atopy, food allergies, and too many lipomas to count. He is on apoquel, tramadol, gabapentin, thyrotab, and enalapril. I can’t be sure what is going on with your dog’s skin based solely on the picture you provided, but it looks like the lesions could be epidermal collarettes. These often develop as a result of skin infections or other conditions that cause pustules (pus-filled cavities) or vesicles (fluid-filled cavities) in the skin. It sounds as if your veterinarian is on the right track. Convenia is a good first choice antibiotic in cases like these, but it certainly does work against all types of skin infections. A bacterial culture and sensitivity will determine exactly what type of bacteria might be involved in these lesions and which antibiotics could be expected to work best against it. If the bacterial culture points away from an infection being the primary problem, then a skin biopsy might be a reasonable next step. I do not think lymphoma is likely in your dog’s case, but the biopsy could rule it out and possibly provide the answers you are looking for. Join in and write your own page! It's easy to do. How? Simply click here to return to Reader Questions.